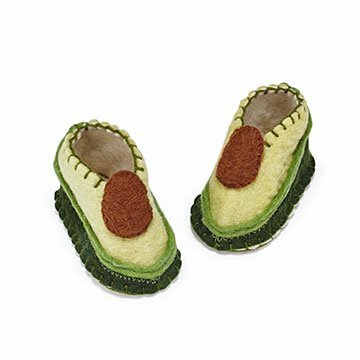 Gulnara Kydymyshova’s foodie baby booties are hand-stitched with adorable avocado details. How do you know when these adorable avocados are ripe? Give them a squeeze and you'll feel perfectly squishy little baby feet. Handcrafted in small batches, these booties are made from natural wool, which is dyed, spun, and felted, before being cut and stitched with delicious details. A cute addition to photo ops and a clever gift for avocado-toast-loving new parents, you can also feel good knowing that purchasing a pair helps support the Kyrgyz tailors who craft the foodie booties collection using traditional techniques. Designed by Gulnara Kydymyshova. Handmade in Kyrgyzstan. Clean with damp cloth and air dry. Adorable hand-crafted booties. Nothing like these anywhere! I can't think of a better place to shop for unique gifts. I use uncommon goods regularly to give uncommon gifts to and from an uncommon friend.